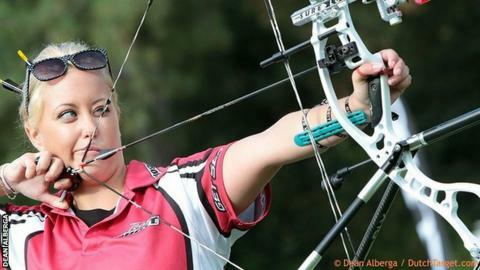 Jersey archer Lucy O'Sullivan has qualified for the Great Britain team for the European Championships in Armenia next month. Her single round score of 147 in the 50m compound at the British trials was one point off the national record. But with two six-round scores over 660 she has ensured that she goes to next year's World Championships in Denmark. "I knew I could be on for a record, but my last arrow was a nine instead of a 10," she told BBC Radio Jersey. O'Sullivan will also fly to Turkey next week for the third round of the World Cup after her impressive scores. "We're using it as a training camp I suppose, but it's going to be a bit more scary than a training camp," she said. And O'Sullivan, who shot at the 2010 Commonwealth Games in Delhi for Jersey, says she is disappointed that archery will not be in this summer's Commonwealth Games in Glasgow, or the next games in Gold Coast in 2018. As a compound archer she cannot shoot at the Olympics, as her technologically-advanced bow type is not permitted at the Games. "I'm really upset that we're not in the Commonwealth Games," O'Sullivan said. "It seems everyone's focusing on that event at the moment, and the Commonwealth Games is our big thing and we're not in the Commonwealth Games."